Summary: The new self-cleaning, pain-free way to groom your pet right at home. Hate grooming your pet with a wire brush, tugging, PetZoom Editors Choice Awards Winner pulling and making a mess all over the floor? Then you need PetZoom, the new self-cleaning, pain-free way to groom your pet right at home.Use PetZoom on both dogs and cats with short hair, long hair, curly hair or any type of fur at all. 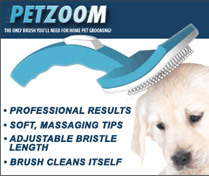 The PetZoom’s soft, ultra-comfort bristles easily adjust for your pet’s individual grooming needs. In fact it’s so comfortable, PetZoom’s patented design has won numerous awards for its gentle grooming and one-touch cleaning. With just one pass you collect all the loose hair, dirt and dander right into the PetZoom. When finished, get rid of all that unwanted pet hair from your PetZoom with just one touch. Grooming your pet has never been this easy.